Innovating as the video slot itself is, the story told in the Warlords: Crystals of Power™ slot is taking place in a time where rulers went out of their way to conquer land and riches. 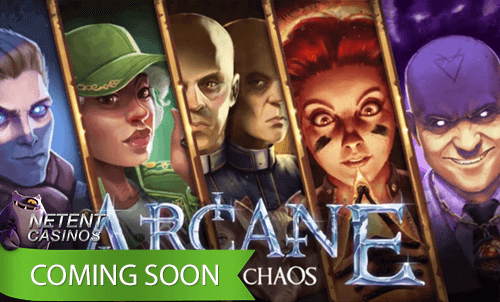 After years of war and pillaging, only three rulers remain: The Barbarian, The Priestess, and The Samurai. It’s these three rulers the Warlords: Crystals of Power™ slot is all about. Preceded by an epic intro, Warlords: Crystals of Power™ is taking you on an exciting journey that one must appreciate. If not for the original story, fantastic theme song or the epic intro, then at least because of an incredible combination of slot features that will keep you captivated for a long period of time, a period in which you have time enough to discover which Warlord you are, The Barbarian, The Priestess, or the Samurai? Warlords have existed throughout much of history and have been playing a pretty important role in China, The Philippines, Afghanistan, Mongolia, Vietnam, Liberia, Iraq, Syria, Libya, Sudan, Russia, Post-Soviet republics, and more. Warlords have been around in Europe in the middle ages and up into the Early Modern period as well. Throughout history, many wars have been fought, empires created, and land was conquered with warlords involved. No wonder NetEnt involved these leaders in a game that must help NetEnt to continue conquering the iGaming industry. I do have the idea that the theme was inspired by the film The Warlords (Tau ming chong) from 2007, previously known as The Blood Brothers, a film based on the assassination of Ma Xinyi in 1870, an historical event that symbolized the serious conflict between the Xiang Army and Green Standard Army, both of which fought for the Qing Dynasty. The films are set in the 1860s, during the Taiping Rebellion in the late Qing Dynasty, telling the heroic tale of three blood brothers and their struggle in the midst of war and political upheaval. I can’t say if Warlords: Crystals of Power™ is indeed inspired by the above films as NetEnt’s version doesn’t tell if the three Warlords are indeed brothers. However, you don’t to be Sherlock Holmes to discover that the video slot is about China. The epic intro does show the impressive land of China, exposed by the Chinese dragons on the walls and the Tibetan wolf so perfectly portrayed by NetEnt’s brilliant designers while the main characters’ costumes are characterising the Qing Dynasty. 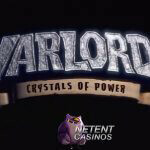 The Warlords: Crystals of Power™ slot was launched three months after the Secrets of Atlantis™ slot, another history-themed NetEnt slot. The world’s history seems to be a favourite topic for NetEnt’s team of talented developers. You can’t go further back in time than with Big Bang™ and Evolution™, based on historical periods of which we can only guess what happened and how long it’s been. I know we want to know all about the Universe and Planet Earth, but we’re not meant to be. Some things in life are simply too complex for the human brains, but we can always guess and fantasise about the biggest events that ever occurred in the universe’s existence. Less recent as well is the Secrets of the Stones™ slot offering you a journey back to a time when Stonehenge was used by the ancient druids, giving you a chance to unlock the mysteries of the famous stone garden. More recent history can be found in Secrets of Horus™, Victorious™, Tales of Krakow™, the vintage-themed video slot Fisticuffs™, but also in Pacific Attack™, Retro Groovy 60’s, Funky 70’s, and Super 80’s, the proof that casino gaming can be very educational. 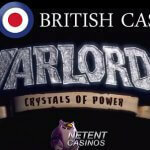 Not really created for the high-rollers, the Warlords: Crystals of Power™ is offering bets starting from 0.15 and 150.00. A great range, but there are NetEnt slots with higher bets available. I’m sure that the majority of the players at the NetEnt Casino will be satisfied with a minimum bet of 0.15, though, or any other bet that can be created thanks to the 10 bet levels and seven different coin levels. I just can’t stop watching the intro that the Warlords: Crystals of Power™ slot starts with, but we all know that true slot excitement doesn’t come from an intro, but from a video slot’s design, engaging soundtrack, and innovative online slot features. Warlords: Crystals of Power™ has it all, though, starting with a perfect introduction telling the story of three warlords and the three diamonds that connects them. Followed by the first glimpse of the NetEnt video slot which is offering an innovative design. The slot’s intro is just a preview of what awesomeness you can expect from the game. It shows that NetEnt again did a great job with its design involving the three Warlords: The Barbarian, The Priestess, and The Samurai, their diamonds, as well as their animal friends. The list of online slot features is as impressive as the Crystals of Power™ slot’s intro bringing Barbarian Free Spins, Priestess Free Spins, Samurai Free Spins, a Final Chance feature, a Battle feature, Wild substitutions, Re-Spins, a Random Overlay Wild, Stacked symbols, and Scatter symbols. It looks like the NetEnt developers pulled out all the stops to make this historical-themed video slot a success. I don’t know where to start describing all the features the Crystals of Power™ slot has been enriched with. There are three different Wild features available in the form of Random Overlay Wilds which is already incredible. They can be activated randomly during a spin in the main game with the standard Wild and all Random Overlay Wilds substituting for any other symbol. – There’s the Barbarian Hammer feature awarding 4 Wild symbols in the shape of a square on reels 1 to 4. – The Priestess Arrow feature will be awarding 2 to 5 Wild symbols on reels 1 to 5. – The Samurai Sword feature awards 2 to 5 Wild symbols on reels 1 to 4. Never seen before in a video slot, the Crystals of Power™ slot features three different Scatters with each Scatter being linked to another Free Spins feature. Scatters are also responsible for Re-spins. If 2 or 3 Scatter symbols of the same type appear on the reels, the Re-Spins start immediately. When two different Scatter symbols appear, the Battle feature is activated. 1 Scatter symbol is randomly chosen after a battle just to make sure that both Scatters are of the same type the moment the Re-spin starts. If no additional Scatter symbols appear during the Re-Spins, a Final Chance feature will be activated. During this special feature, you’ll receive a random feature that shows either a coin win between 3 to 100 times your bet or a third Scatter symbol at a random position on the reels activating Free Spins. 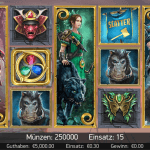 – The Barbarian Free Spins: (Blue Scatter) In the Barbarian Free Spins, only warlord and animal symbols are present and a new Scatter symbol appearing on the reels adds 3 extra Free Spins. 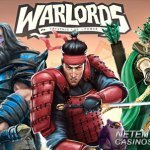 – The Samurai Free Spins: (Red Scatter) In the Samurai Free Spins, the Scatter symbol becomes a Sticky Wild for the duration of the Free Spins. With three different Scatters corresponding to three different Free Spins features, as well as three different Wild features, you can expect three times the excitement. And that’s not all as there’s the Battle feature and Final Chance feature too. No wonder that this NetEnt was received well by the industry even before its launch at the NetEnt Casino. Get closer to conquering the world in the Warlords: Crystals of Power™ slot and find out which Warlord you are: The Barbarian, The Priestess or maybe the Samurai?